Britishers are known for their royalty and they are famous for their love for automobile engineering. Cars like Jaguar, Astin Martin, Rolls Royce were their inventions, however their love in not limited to four wheelers. Ever seen a bug eyed monster with voluptuous body and as powerful as a beast? We know an exclusive two wheeler engineering which was established in 1983 by John Bloor - “Triumph” and one of their famous models is the “Triumph Street Triple RS”. This beast may come across like an ordinary looking motor cycle. It is rightly said “Don’t judge the book by its cover”. And this is so true in Street Triple RS’s case. Let’s know more about this beast. With Triumph Street Triple RS you get your fantasy comes true. The first interesting thing you will notice is, the bug-eyed headlamps. They look unusual with LED DRL’s which are far soothing to our eyes. The bar end mirrors are so powerful that they don’t vibrate even when you accelerate hard. The major highlight of Triumph Street Triple RS is that it has a five inch TFT display. It displays information like ride mode, ambient temperature, fuel gauge, service reminder, and a lot more. With 765 cc Triumph Street Triple RS proves to be the real beast. With 765 cc in-line three cylinder, you reach speeds within seconds. Thanks to its breaks which gives you a super bite and feedback. It gives a mileage of around 20kmpl in the city. It is also well equipped in terms of the rider's safety. It has top of the line Brembo M50 monobloc callipers with 310mm discs at the front and single piston calliper gripping into a 220mm brake disc. You are just a click away to get your Triumph Street Triple RS bike insurance policy. Coverfox.com offers great discounts with top-notch insurers. And you receive the policy within few minutes of your transaction. Coverfox.com has a fantastic set of customer-centric advisors, and post-sales service managers who help you with your after sales query. Supporting them is the claims team, who make the claim as easy as a pie. 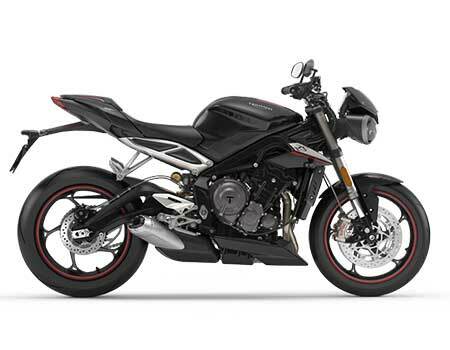 All we can say is that Triumph Street Triple RS is every youth’s sport bike. However it seems little costlier as compared to other bikes of the same segment. What are the features of Triumph Street Triple RS? What is the mileage of Triumph Street Triple RS? The Triumph Street Triple RS gives a mileage of around 20kmpl in city. How to make a claim on your Triumph Street Triple RS? You are just a call away to claim on your bike insurance with Coverfox. We have a specialized team who intimates claim on your behalf and keeps you posted with regards to the claim status. Coverfox.com's claims team follows until claim settlement. You can also write us on help@coverfox.com for claim intimation. Why should you insure your Triumph Street Triple RS? Insuring your bike will cover risk in case of any accident. This cover takes care of the damages that will be caused by accident. Insurance will cover the owner driver and third party property damage. Also in case of theft, you could land in soup and have major losses if your bike is not insured. Hence one should compulsory have a bike insurance policy.